RAVENSWOOD — Construction on Metra's Union Pacific North line, including the replacement of 22 aging bridges, is coming to a close — or at least the first half of the first phase is nearing completion. During phase one, Metra has been rebuilding bridges from Balmoral Avenue on the north to Grace Street on the south — 11 of the 22 bridges — one side of the tracks at a time. Simultaneously, a new station at Lawrence Avenue has been under construction — the busiest stop on the UP North line, according to Metra. During a meeting hosted Tuesday by the Ravenswood Community Council, Metra representatives presented an update on the project's progress. Joe Ott, director of construction for Metra engineering, said the new station is projected to open in May 2014, when the majority of work on the west side of the tracks will wrap up. The focus will then shift to the east side of the tracks, where new bridges will be built for a second track over the same 11 streets. As with the west side, construction will include retaining wall work and new track. 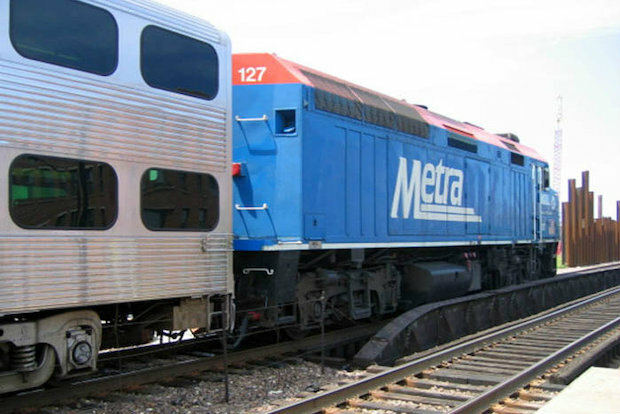 Metra will issue a new contract for work on the east side. Ott said he expected the project to go out to bid by July or August, with work potentially beginning in late fall but more likely in spring 2015. "I think it will take all of a year," he said of the east side timeline. "I want to push and get it done as fast as possible." Commuters will be cheered to hear that part two of phase one also includes building out a vendor space in the station. "There's room for a coffee shop," Ott said. "We have interested parties." Less thrilled: Business owners on the east side of Ravenswood, who expressed concerns about the impact of the project on their operations. "They shut the west side of the street down" during construction, said Jim Cavanaugh of Schulhof Co., a plumbing supply wholesaler at 4701 N. Ravenswood Ave. "We'll be out of business if they close the street." In recent years, the Ravenswood corridor has become a magnet for restaurants and artists, yet a number of manufacturers and industrial suppliers still line the avenue. Companies like Schulhof rely on a steady stream of incoming and outgoing semi-trucks to keep product moving. "We need that turn for a semi to swerve in," Cavanaugh said. Ott promised to work with businesses to create a plan that would be "sustainable for the community." "We will try to make the impact as minimal as possible," he said. "We want to work with you guys and keep you open." When Metra finishes work on the east side of the tracks, construction will shift south, representing phase two of the bridge replacement project. Rebuilding the remaining 11 bridges — located between Addison Street and Webster Avenue — is expected to last through 2019.